The U.S. U-20 team is currently in South Korea for the U-20 World Cup. They are in a decently tough group with Ecuador, Saudi Arabia, and Senegal, and they kicked things off against Ecuador early this morning. The U.S. got off to a terrible start, as they conceded two goals within the first seven minutes. Gedion Zelalem looks like a crucial player for the U.S., but he went off with a non-contact injury in the 33rd minute. 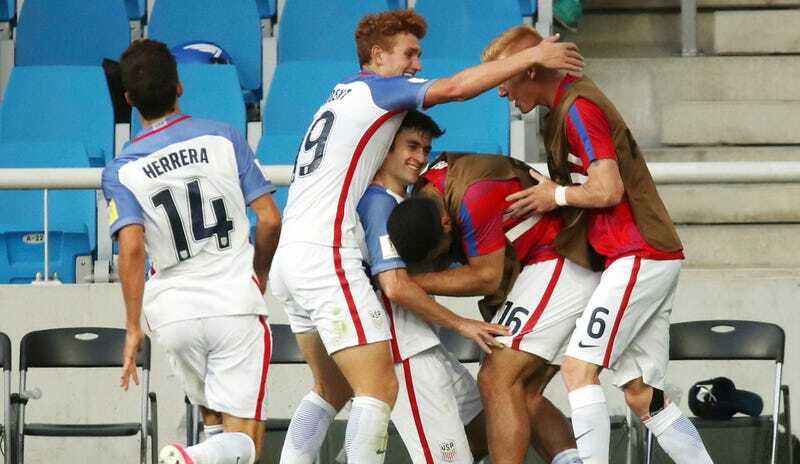 Eventually, the team settled down, and 17-year-old sensation Josh Sargent showed he belonged up a level with the U-20s when he put in a pair of goals. Word to Brooks Lennon for the immaculate cross. Jonathan Klinsmann (son of Jurgen) then handed the lead right back to Ecuador by when he lost his mind and tried to dribble out of pressure instead of getting rid of the ball. Trailing 3-2 heading into stoppage time, the U.S. needed a miracle. Enter Fulham midfielder Luca de la Torre. This possession was probably the U.S.’s last chance to score, and de la Torre’s emphatic goal capped off a wild game. The promising U.S. team will next face Senegal, the best team in the group. If Zelalem is out, they could have problems creating offense, but this team at least has a flair for the dramatic.